Carol Reafs is the park steward for Patmore Pit, and helps keep everything running smoothly. Please makes sure to say thanks when you next see her! Mysteriously named (there is no pit! 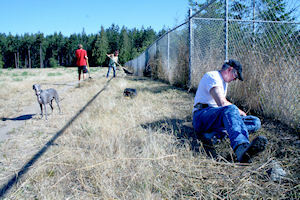 ), the Patmore Pit off-leash park is just south of Coupeville with the largest fenced area of all the Whidbey Island off-leash parks. 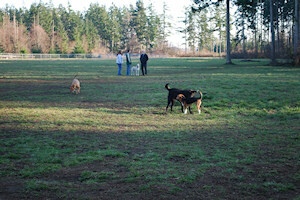 Patmore is a 15 acre meadow, now completely fenced, with a separate fenced agility area, fenced small dog area, toys, water, and poop bags provided. The main attraction at Patmore Pit is wide open space for unrestrained games of Frisbee or fetch. People who walk the paths around the park get almost as much exercise as their pooches, since the area is so large. How to get there: Patmore Pit is to the west of the Naval Air Station Outlying Field. 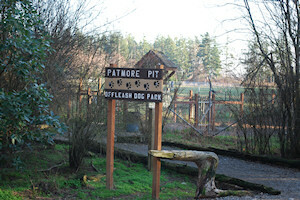 From SR 20, turn onto Patmore Road, go past Keystone Hill Road and turn left onto the drive leading to the parks maintenance facility and Patmore Pit Off Leash Park at the dead end.